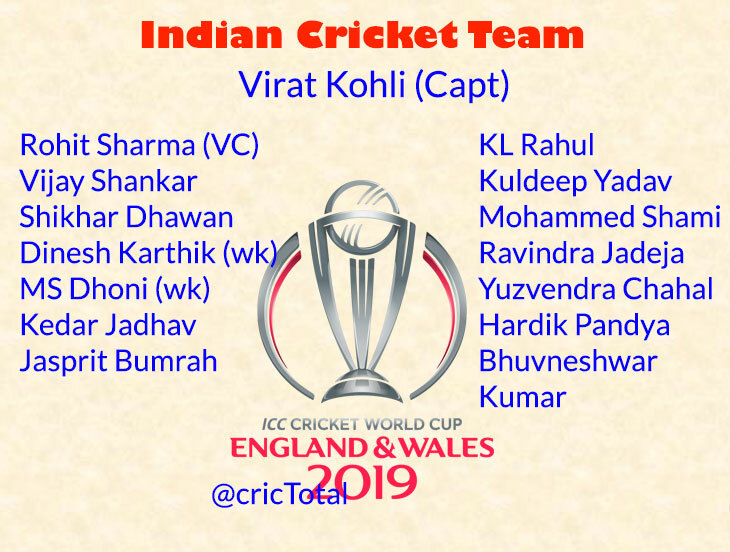 Mumbai: India became the third team to announce their squad for the 10-nation ICC Cricket World Cup 2019, to be held in England and Wales. This team announced for the World Cup is provisional. Any board to be made the changes without the permission of the ICC till May 23. The biggest talking points are the inclusions of Dinesh Karthik and Vijay Shankar over Rishabh Pant and Ambati Rayudu. There had been a lot of talk regarding the potential number four for India, a pain point that the team has been trying to resolve for quite a while now. India went in with two potential options with Dinesh Karthik and Vijay Shankar. The reserve 'keeper slot has gone to Karthik, while KL Rahul can be slotted in as the back up opener. Ravindra Jadeja took up the third spinner's slot, alongside wrist spiners Yuzvendra Chahal and Kuldeep Yadav. The four pacers in the side picked themselves with Jasprit Bumrah leading the attack that also includes Mohammed Shami, Bhuvneshwar Kumar and all-rounder Hardik Pandya.